The Naples area was in many ways anarchic. But having just spent 3 months living and working in Moscow, I felt surprisingly at home there. When a plane lands, most Canadians remain dutifully seated until the plane has stopped taxiing and the seatbelt sign goes off. Back in the 1990s that certainly wasn’t true of either Muscovites or Neapolitans. As soon as the plane had appeared to halt, they would leap up and start yanking stuff out of the overhead lockers, while fraught airline attendants rushed around trying to stop them. Once I was sitting next to a Neapolitan woman who was so desperate to get her bag she actually climbed over me. I’ve mentioned before the concept of pravosnoznanie (legal consciousness), the lack of which philosopher Ivan Ilyin believed made Russia ill-suited to liberal democracy. In examples like this, you get a sense of what he was talking about. In his 1993 book Making Democracy Work: Civic Traditions in Modern Italy, Robert Putnam shed light on this phenomenon by comparing identical government institutions in northern and southern Italy. He determined that the former were more effective than the latter because while in Northern Italy there was a highly developed civil society, in southern Italy, the social focus was the family. As a result, northerners were more engaged in the success of their communities, there was a higher degree of trust between groups and between citizens and their government, rules tended to be followed, and government was less corrupt. Fast forward to 2016, and we see a somewhat similar thesis about Russia published this week by Anna Arutunyan, entitled ‘Only connect: Russia between individualism and collectivism’. Arutunyan begins with a story of a tourist agent in northern Russia whose effort to take people sailing fails because, despite taking the agent’s money, the sailor/tour guide fails to turn up. ‘I changed my mind’, he says later, ‘What? I am a free man. I want to be alone with the sea’. Arutunyan identifies this as an example of a Russian type of extreme individualism which contrasts with the normal cliché of Russian collectivism. Russia’s problem, Arutunyan maintains, isn’t that it lacks the formal institutions required for a successful country. Rather it is a ‘problem of lack of social bonds.’ Opinion polls show that Russians don’t trust one another, define themselves as ‘their own person’, and volunteer much less than most other Europeans. In short, they are much like the southern Italians described by Putnam. The corruption which marks both places is thus a product of society, rather than of corrupt leaders. Indeed, the latter are merely the inevitable by-product of the former. The dichotomy of individualism versus collectivism … does not seem to work because extreme cases of both tendencies are present in equal measure. Recent studies on collectivist values suggest that Russians tend to ascribe to those values more than Americans or Europeans, but realities on the ground demonstrate that they do not act on those values. Collectivist values are strong, but in practice, social capital is weak. Arutunyan notes that new types of community are developing in Russia, and remarks that, ‘The clues where Russia is headed next … lie not so much with the Kremlin’s unpredictable actions, but on a local level with the relationship patterns inside these nascent communities.’ If this analysis is correct, then the development of civic virtue at the lowest level will do more to transform Russia than changing leaders or reforming political institutions at the top. This week’s book shouldn’t actually be shelved among my Russian stuff as it is about the former Yugoslavia. Nevertheless it is worth discussing as it fits quite well into the debate we had in the comment section of this blog recently on the subject of federalism in multi-national states. As a communist country, Yugoslavia didn’t tolerate what we might consider ‘normal’ interest group politics. Nor did it like the idea of civil society existing independently from the state and the communist party. But it did permit, even encourage, national institutions and national interest politics (by ‘national’ I refer not to the Yugoslav level but to the level of the national republics which Yugoslavia was composed of). As time went on, in order to keep the squabbling nations together, Yugoslav leader Josip Tito devolved more and more authority to the country’s constituent republics. Eventually, there was no longer even a Communist Party of Yugoslavia, just a League of Communists of Yugoslavia (LCY), made up of the separate communist parties of each republic. Almost until the final collapse, there wasn’t even a central Yugoslav TV station – only national, republican ones. Given the lack of institutions crossing national boundaries, when the LCY surrendered power the country inevitably fell apart along national lines. I think one can see a somewhat similar pattern in some other countries. Saddam Hussein’s Iraq, for instance, did not look too kindly on civil society, but it did tolerate some degree of independence for religious and tribal institutions. Thus, when Saddam was driven out of office, the country split on religious and tribal lines. I would expect something similar to happen whenever an autocratic regime collapses – authority shifts to whatever institutions still exist and have retained some legitimacy. If those institutions are ones which serve to unite, then the country may hold together; if not, civil war is very possible. In March last year I wrote a piece about Russian strategic culture. Events this week make this a good time to return to the subject. Over the weekend, the news from Syria was of continued advances by the Syrian army and of its impending encirclement of the city of Aleppo. The general feeling was that the Syrian government would in due course recapture the whole of Aleppo. This would be a significant victory for the government and its Russian allies. Moscow’s military support has clearly played a crucial role in turning the fortunes of war in Bashar al-Assad’s favour. It was, therefore, something of a surprise when Russian president Vladimir Putin agreed with US president Barack Obama to a ceasefire which will come into effect in a few days’ time. After all, when you are winning, it makes sense to keep on going, rather than stop. A ceasefire will hamper the Syrian army from continuing its advance and securing full control of Aleppo. It seems to rob Assad of victory just when it is in his grasp. Yet this fits with a pattern of Russian behaviour. In August 2014, rebel forces in Ukraine, almost certainly with Russian help, smashed the Ukrainian Army south of Donetsk and advanced to the outskirts of the port of Mariupol. By the start of September, the rebels were on the verge of entering the town. The Chief of Staff of the Ukrainian Army, General Muzhenko, later admitted that ‘after 29 August  we had no combat-worthy units from Ilovaisk as far as Nikolaev and Odessa’. This may have been an exaggeration, but it is nevertheless clear that the rebels probably could have pushed further had they been allowed to. Instead, on 5 September 2014, Russia signed the Minsk-1 peace agreement and got the rebels to do likewise. Similarly, the Minsk-2 agreement came just when the rebels were on the verge of recapturing the town of Debaltsevo in February 2015, at a time when they were wanting to advance still further. And back in 2008, Russian troops responding to Georgia’s invasion of South Ossetia pulled back just before reaching the Georgian capital, Tbilisi. In all of these cases, what we see is Russia achieving a military victory and then refusing to press the advantage militarily but instead halting in order to convert military success into diplomatic success. I think that this pattern reveals something about Russian objectives and how Moscow views the use of force in international relations. First, Russia seems to be aware of the limitations of its power, and to be cautious about sticking its neck out too far. Second, for all the complaints that Russia wishes to destroy the existing international order, conquer large parts of Ukraine, and so on, its behaviour suggests that its objectives are far more limited. Once Russia has achieved these limited objectives, it sees no need to continue using force. Third, this means that Russia views military power as an extension of diplomacy, not a substitute for it. Whereas modern Western states often pursue absolutist goals – regime change in Iraq and Libya, for instance – Russia seems to view the purpose of force not as being to destroy its enemies but rather to get them to talk. Once the enemy agrees to talk, Russia is prepared to talk back. In the event that no deal proves possible, it can and will turn the violence back on. Fourth, Russia is serious about striking diplomatic deals with Western states. When it gets the opportunity to make a deal, it does. The terms of the Syrian ceasefire state that ‘the cessation of hostilities does not apply to Daesh [Islamic State], Jabhat al-Nusra, or other terrorist organizations designated by the UN Security Council.’ This means that the US and its allies can continue to strike against those terrorist organizations but they can’t fight against the Syrian army. In effect, the agreement amounts to an abandonment of the Americans’ objective of regime change. This represents a diplomatic victory for Russia, which it is happy to seize, even if that means halting the Syrian army’s advances. But we should not imagine that Russia will simply send its troops back home. If the ceasefire unravels, Moscow will then pursue further military successes which can be translated into diplomatic gains, in an incremental process. The absolutist goals pursued by Western states are to some degree a product of a concept of war which defines it as something which can only be justified by extremely important goals. One cannot wage war just to secure some minor diplomatic advantage, only to fight some evil, which much be destroyed or forced to submit entirely. When that proves impossible, as it often is, Western states, unable to give up for fear of losing face, are left floundering. By contrast, Russia appears to view war in a manner more in keeping with a Realist, one might say Clausewitzian, definition as a continuation of political discourse by other means. Military force is used to achieve limited military objectives, which are closely tied to political ones. In some respects, that could be seen as a cause for alarm. The idea that force is just another tool of diplomacy which can be turned on and off in pursuit of incremental gains is that one many may find uncomfortable. On the other hand, war of this sort does have the merit of being limited in its objectives. If my analysis is correct, then this should provide some reassurance to those who imagine that Russia is embarked on a grandiose strategy of aggression. The Russian think tank ‘Rethinking Russia’ has published an article I wrote about Henry Kissinger’s recent meeting with Vladimir Putin. This follows a piece on the same subject by Russian political philosopher Boris Mezhuev, which the think tank published a couple of days earlier. You can read my piece here and Mezhuev’s here. In my article, I take the opportunity of Kissinger’s visit to Moscow to call for a return to pragmatism in Russian-Western relations. In my view, the neoconservative obsession with the analogy of 1930s appeasement has led to an unhealthy belief that talking to those with whom one has disagreements is a sign of weakness which will invite aggression. But whereas I support the idea of dialogue between Russia and the West and a more pragmatic approach to foreign policy, Mezhuev favours separating Russia and the West and adding a new ideological element to their relationship. I am afraid that is the only option available. Either a new American administration will regard Russia as a distinct civilization marked by its own value code and special rights sanctified by history, or it will treat Russia just as a target. … We [Russia and the West] both need to understand that the language of civilizational geopolitics guarantees Europe’s survival, it is a diplomatic tool to avert World War III. This is certainly an interesting thesis, and I see where Mezhuev is coming from. Westerners often seem far more upset by Russia’s failure to become a fully-fledged liberal democracy and by its opposition to Western foreign policy than they are by much more despotic and uncooperative regimes elsewhere in the world. Sinopobia, for instance, seems much less intense than Russophobia. I suspect that this is because people in the West recognize that China is different. They don’t expect the Chinese to behave like them and so aren’t particularly cross when they don’t. This isn’t true with Russians – they are thought to be if not exactly Western then at least not unWestern. Recognizing Russia as a separate civilization would allow us to tolerate each other more easily. The problem with this idea is that it is based on a fiction. The reason why Westerners do not for the most part consider Russia to be a distinct civilization is because it isn’t. Yes, there are definite differences between Russia and, say, Canada, but there almost equally pronounced differences between countries in what is called the ‘West’. For instance, American attitudes towards guns, God, health care, and imprisonment (such as locking up a man in solitary confinement for over 43 years) completely baffle many Canadians. The ‘West’ is not a monolith, and Russia has a great deal in common with much of it. You can’t just declare Russia to be a separate civilization and expect everyone to believe it. More precisely, I don’t think for one instant that neoconservative appeasement-analogy thinkers would go along with it. They believe that ‘American values’ are universal. If they were to accept the idea that there are different civilizations with distinct values, they would have to abandon this core belief. I see no way that American leaders will ever accept the ‘language of civilizational geopolitics’. In any case, Mezhuev’s position is far too pessimistic for me. It suggests that Russia and the West cannot live together, and need to be physically separated. I do not see why this should be the case. Current crises will pass. American exceptionalism and universalism will decline. New opportunities for working together will arise. We should be speaking to one another in order to improve our relations, not making it harder to do so. Given that this week is the 100th anniversary of Russia’s victory over Turkey at Erzerum, it is a happy coincidence that this Friday’s book is Roger Ford’s 2010 work Eden to Armageddon: World War I in the Middle East. This is popular rather than scholarly history, which is to say that it is based entirely on secondary sources. But whereas most histories of WWI in the Middle East (very broadly defined as meaning the territories of the Ottoman Empire) focus almost exclusively on the clash between the British and the Ottoman Empires, Ford also devotes considerable space (about 80 pages) to the Russo-Turkish front. If you are looking for an introduction to Russia’s war against Turkey, these 80 pages are as good a starting point as any. Lavoie divides his book into two sections: the first is an analysis of the events which led to the war in Donbass; the second is a description of a month-long trip to Ukraine in early 2015. Along the way, the author views the damage caused by government and rebel shelling, meets supporters of both sides in the conflict, and allows each their say. Lavoie’s journey begins in Kiev, from where he goes to the former rebel strongholds of Kramatorsk and Slavyansk, after which he enters rebel-held territory and attends Artyom’s funeral in Donetsk. He then travels to the port of Mariupol in southern Donbass before returning to Kiev and ending his trip in Lvov. Lavoie remarks that ‘my instinct tells me that the European model remains the best option for Ukrainians, even the Russophones of the east.’ Nevertheless, he comments that, ‘Everyone is to blame … for this vain and useless war,’ and it is ‘the revolutionaries of Euromaidan’ and the politicians whom they brought to power who receive the brunt of his criticisms. The events of Maidan struck fear into many people in Crimea and Donbass. Whether these fears were justified isn’t important, Lavoie says. What mattered was that these fears existed. Addressing Artyom, he writes, ‘Your parents’ worries and those of millions of others about what happened on Maidan were not fictional. … They needed to be reassured.’ Instead, according to Lavoie, ‘Those who took power in Kiev suffered from a victor’s complex. They could not think of negotiating with those who opposed the changes. They had achieved their revolution at the cost of a hundred dead. They believed that they had won the right to impose their vision of the country. It was for the vanquished to adapt, to ally themselves with the victors, or to shut up.’ The result was war. At a presentation Lavoie recently gave in Ottawa, a Polish diplomat delivered a long rant denouncing him for ignoring what the diplomat considered the real cause of the war in Donbass – Russia. I fear that this reaction may be fairly typical, and that Lavoie’s message will fall on deaf ears. This is a shame. The message needs to be heard. I encourage Frédérick Lavoie to have his book translated into English so that it can reach a wider audience. It deserves to. Today is the 100th anniversary of one of the greatest Russian victories of the First World War – the capture of the Ottoman fortress of Erzerum on 16 February 1916. The Erzerum complex, consisting of a core of 11 forts and batteries with two more forts on each flank, and with a garrison of 50,000 men and 300-400 guns, was the centrepiece of the Ottoman line in Anatolia, Eastern Turkey. Against it were 80,000 troops of the Caucasus Army of the Russian Empire. Thus, although the Russians had an advantage in numbers, it was not at all the 3-1 majority normally considered necessary for a successful attack, let alone an attack against such a powerful objective. The Caucasus Army had begun an offensive against the Turkish defences in Anatolia on 10 January 1916. The idea was to inflict a serious defeat on the Turks before reinforcements could arrive from Gallipoli, which had recently been abandoned by the British. Six days after the offensive began, the Turks abandoned their positions and withdrew towards the protection of Erzerum. On 19 January, the Chief of Staff of the Russian First Caucasian Army Corps, Major General V.G. Lastochkin, telegraphed the Viceroy of the Caucasus, Grand Duke Nikolai Nikolaevich, asking for permission to assault Erzerum on the run with the forward elements of his corps before the Turks could organize their defences. The Grand Duke rejected the proposal, considering it too dangerous, and the Russians waited until they had brought up all their forces before preparing their next move. At the end of January, the Commander of the Caucasus Army, General N.N. Iudenich, decided to risk an all-out assault on the fortress. Grand Duke Nikolai Nikolaevich was reluctant to give his approval, but eventually relented and on or around 1 February gave Iudenich permission to proceed. On 11 February 1916, the assault began. The Russian point of main effort was an attack across the Kargapazar ridge north of the fortress. The Turks had left this mostly undefended due to the mountainous terrain and the harsh winter conditions, which they felt made the ridge impassable. The Russian soldiers were, however, able to cross the ridge in force, and by 14 February had outflanked most of the fortress’ defences. The next day, the Turks began to abandon Erzerum, and on 16 February the Russians entered the city. “The Lord God has given such great help to the super-valiant forces of the Caucasus Army that after an unprecedented five-day storm Erzerum has been taken,’ the Grand Duke telegraphed to the Tsar, adding that his army had taken 14,000 prisoners. After Erzerum the Caucasus Army continued to advance westwards into Anatolia. The Ottoman Army never fully recovered. Had the revolution of 1917 not intervened, total Russian victory over Turkey would have been assured. 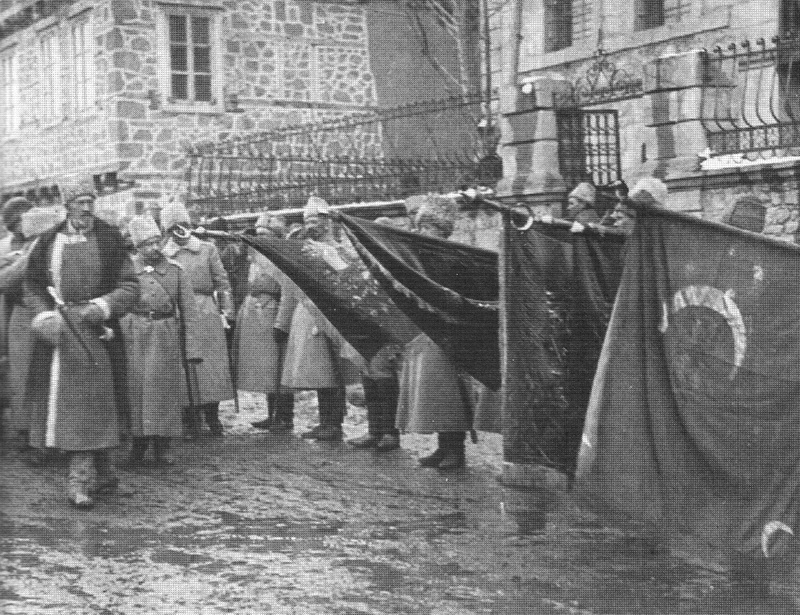 The Grand Duke reviews Russian troops at Erzerum.